Are your cosmetics tested on animals? Our products are not - and never have been - tested on animals. Additionally, we require our suppliers to confirm that the raw materials we order from them have not been tested on animals, either. We strongly oppose such practice. We believe in alternative tests that are both safe and effective, and, most of all, guarantee product safety. We are licensed user of the People for the Ethical Treatment of Animals (PETA) mark. It is the largest organization fighting for animal rights in the world, associating over 6.5 million members and supporters. We have always been against animal cruelty and never tested our products on them. However due to the increasing number of inquiries, we decided to obtain confirmation of our statements from an independent organization. Who do you test your products on? We test our cosmetics on ourselves first. We also invite our friends. Later, we have formulas tested by an independent laboratory, where tests are performed on volunteers. Where does the name Bandi originate? The company was first called B&D – from the initials of the founder, Bogda Draniak. With time, the name underwent various changes, the English name stirred confusion, so finally we decided on Bandi. Is Bandi a Polish firm? Yes, we are a Polish family company. We make our cosmetics in Poland, in Czosnów, just outside Warsaw. Can you send me samples of your products? Unfortunately, we do not send samples without a placed order. We add samples to every order, we also provide them to the beauty salons we cooperate with, as well as hebe drugstores. There, you will also find testers of our products. To find a beauty salon or a hebe store near you, click here. Where can I find the product INCI in your online store at bandi.pl? Ingredients (INCI) are visible next to every product. Go to our website and choose the product of interest. The INCI is on the left, under the picture. Are your cosmetics suitable for vegans? Most of our products are suitable for vegans. However, some may contain ingredients of animal origin, such as bees wax or collagen. All cosmetics suitable for vegans are marked with a PETA mark "cruelty free and vegan". You can find it on our web page, underneath a product photo. I am allergic to wheat and parsley. Can I still use your products? We cannot guarantee that using a formula containing wheat or parsley won´t stimulate an allergic reaction. In such case, it is best to consult a doctor. I have irritated skin and after using one of your products the problem has increased. What should I do? How should I perform a cosmetic tolerance test properly? Apply a small amount of the formula somewhere around the jaw and observe the skin reaction immediately, after 1, 8 and 24 hours. Repeat the routine after 24 hours. In case of a strong reaction or a presence of skin lesions (rash, persistent erythema, itching, swelling, effusion) withhold from further using the product. Is the glycerin you use of plant origin? Glycerin we use in our cosmetics comes from vegetable fats and oils. There are so many different cosmetics you have on offer. How should I know which line to choose? Everyone has a different type of skin and each skin has different demands, that is why best effects are achieved by combining various skin care lines. It is best that you contact our specialist at kosmetolog@bandi.pl. The cosmetologist will provide you with personal advice and carefully select the products best suiting your needs. Can I use products from two different lines, e.g. Professional Line and Delicate Care? You most certainly can. Our cosmetics are compatible with each other, allowing you to combine them freely. We only advise you not to join products with exfoliating acids with retinol cosmetics to avoid intensifying the exfoliating activity which may lead to irritation. Do Bandi cosmetics contain parabens? Although we use many natural raw materials in our products, we do not turn away from biotechnological advances. 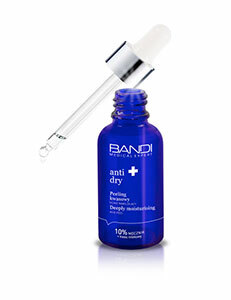 Our priority is for Bandi cosmetics to be highly effective. For example, vitamin C used in C-white line is ascorbyl tetraisopalmitate – a form acquired in a laboratory and incomparably more effective than the natural form of vitamin C.